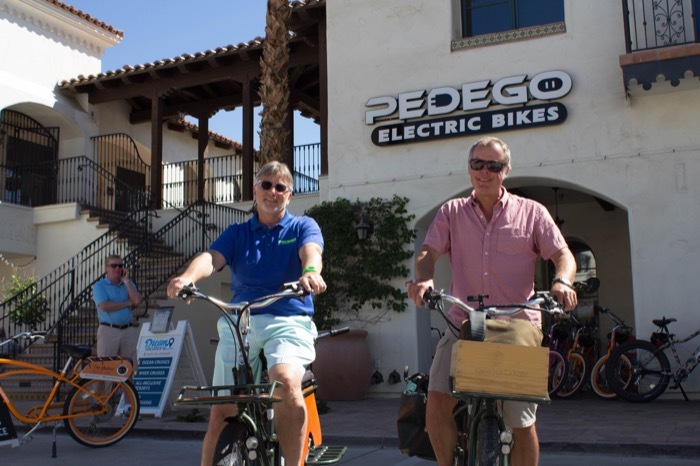 Pedego president Don DiCostanzo (left) with electric bike adventurer Jon Langille on their Pedego Stretch cargo bikes. Electric bike adventurer Jon Langille rode a Pedego Stretch electric cargo bike 3,000 kilometres from Nelson, British Columbia, to Indio, California and spent about 132 hours sitting in the saddle. He surmounted over 19,145m of elevation gain (over two Mount Everests), his longest ride was 157.3km (98 miles) from Klamath Falls, Oregon, to Dunsmuir, California, and his biggest single climb was 1,053m (3,545 feet) to Idyllwild, California. He navigated past lakes, plains, mountains, cities, rivers and canyons in temperatures ranging from 5°C to 35°C. And all of this to attend a rock concert in Indio, California. 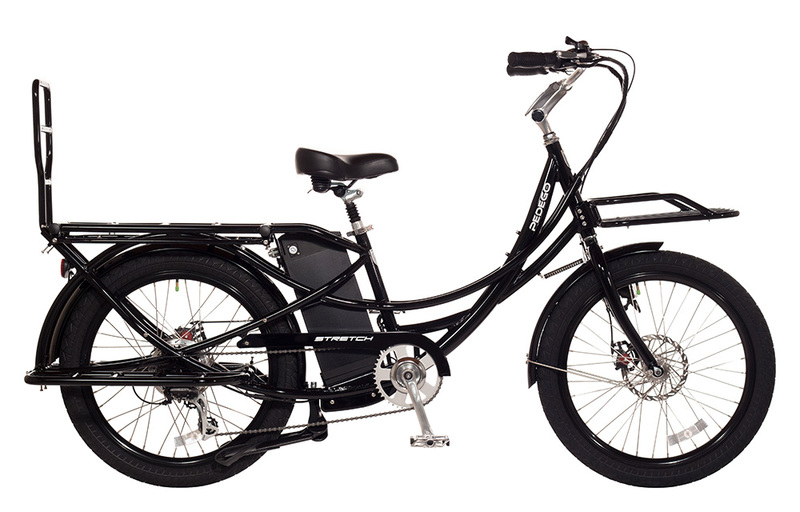 So who better to tell us about the strengths and weaknesses of the Pedego Stretch cargo bike!? Hi Jon. You spent a lot of time on your Pedego Stretch – what is your favourite feature? Besides the sheer stability of the bike I’d say I like the easy adjustability of the handlebars and seat. Through a long day in the saddle, it’s nice to reposition your body for awhile. What’s your least favourite feature? Not much I don’t like about it. I do wish it was lighter though. Maybe with styrofoam batteries that recharge in an hour? (laughs) But really, besides that and water on Mars, I can’t think of anything. 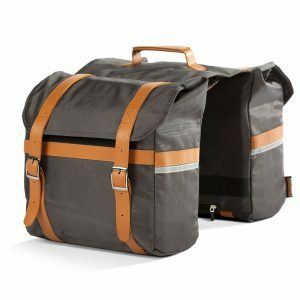 Perhaps Pedego could develop a line of precisely fitted panniers and other travel bags? How has it lived up to your expectations? Very much so. The Pedego Stretch has provided all the power I’ve needed for the hills and the headwinds. It’s comfortable to ride and remarkably agile for it’s size. What did you primarily use it for before embarking on your epic journey? To and from work, A to B, shopping trips. I point out to people that I live in a town with 20%+ grades. What have people’s reactions been to the bike? People love it. They’re impressed by the design, classic Euro cargo styling, and the strength of it when they see the load. If you could change anything about the Stretch, what would it be? It’s so versatile now with the various configurations of the racks that the only improvements I can think of are, as mentioned, some add-on bags specifically designed for touring, including a spare battery case. 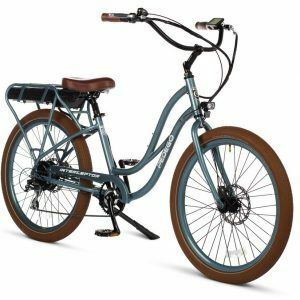 Would you recommend this bike to anyone and if so, who and why? I would and I do. For anyone who’s wanting to use their bike as a car replacement, this is it. I can pack a week’s worth of groceries for a family of four up a 20% grade for many kilometres. I can give my kids a lift. What more could you want? And if you just want to go for a long ride, a lot of the racks can easily be removed to lighten the bike. To learn more about Jon’s journey, included the day-to-day updates, log on to: pedegoelectricbikes.ca/roadtrip.